USA’s Vincent Zhou performs his free skate at the 2017 World Junior Figure Skating Championships. The “quad explosion” of this season continued in the Men’s event at Junior Worlds. Spurred on by the development at the senior level, the juniors have upped the ante as well. Ten clean quads were landed and eight more attempted at Taipei Arena. Zhou was the most successful jumper, hitting not only a quad Lutz, quad Salchow-triple toe and another quad Salchow, but also two triple Axels in his program to the “Casablanca” soundtrack. The performance was flawless, all jumps were clean and with each jump landed, Zhou’s smile grew broader. The US silver medalist was fifth after the short, but it was obvious after his free skate that this would bring him on to the podium. In the end, the 16-year-old was the golden boy of the night, surpassing his previous personal best by 34 points with a score of 179.24 points. Overall, he had 258.11 points. Aliev had won the short program last year at Junior Worlds like he did this year, but this time he stayed on the podium. A year ago, he faltered in the long program and finished sixth. The Russian Junior champion almost fell on the quad toe at the beginning, but the rest of his romantic program to “Broken Vow” (without any further quad attempt) went smoothly, except for an underrotated triple flip. The ISU Junior Grand Prix Final Champion scored 163.83 points, a personal best, which added up to 247.31 points overall. Skating to “Maybe I Maybe You” by the Scorpions, Samarin hit two quad toes and all his other jumps, but the overall quality of his performance and skating was not as good as his main competitors’. The Muscovite scored 245.53 points and was not pleased with his result. Teammate Alexander Petrov remained in fourth place, but he would have been a worthy medalist, as well. The skater from St. Petersburg landed a clean quad toe and all his triples in his Frank Sinatra routine. The short was clean as well (243.47 points). The quality of his elements and his skating was superior to Samarin’s, but he didn’t get any presents from the judges. 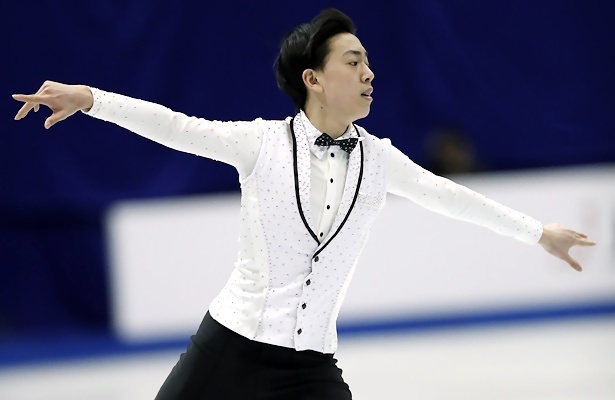 South Korean talent Jun Hwan Cha hit a quad Salchow-double toe, but he fell on an underrotated second quad Salchow and this, together with another underrotated triple Salchow, was enough to kick him off the podium. The 15-year-old dropped from second after a good short to fifth overall. He was the youngest of the top ten skaters and shows huge potential (242.45 points). A year ago, Daniel Samohin rallied from ninth in the short to win the title. This year, he was too far behind to make the podium, but he came close. The Israeli skater struggled with all his jumps in the short which left him in 16th place. With nothing to lose in the long, the dynamic Samohin came out, nailed two clean quads and moved up to sixth. He was pleased to have come back strong (232.63 points). Other notable performances came from Kevin Aymoz of France, who is an interesting skater with extravagant programs (seventh) and Alexei Krasnozhon (USA) in eighth. Krasnozhon went for the quad loop, but it was downgraded. Canada’s 2016 World Junior silver medalist Nicolas Nadeau produced a good short and was ranked seventh in this segment, but then he popped several jumps and dropped to 12th. Andrew Torgashev (USA) struggled with all his jumps in the short program and failed to qualify for the free (25th).